With short-form internet video reaching more and more consumers (Vine, Instagram), Vello’s timing for bringing their video greeting card app to market is excellent. In short, Vello is an app that creates these video greeting cards by allowing one or more people to capture six second videos of themselves celebrating or communicating to the greeting card recipient. The app then strings each contributor’s video together into one long video and delivers it to the recipient as email link that can be clicked and watched. Additionally, each person can contribute money to a gift card that is delivered along with the video, and therein lies the monetization strategy, however the gift card is not mandatory. That’s really about all there is to it. Indeed a simple concept (with undoubtedly a complex engine behind it). But if this iOS app — which is still in the approval process at this point — is as easy to use as the team promises, I could see how it could catch on. But perhaps other potential exists as an acquisition target of social networks which could further streamline the integration and extend the reach. 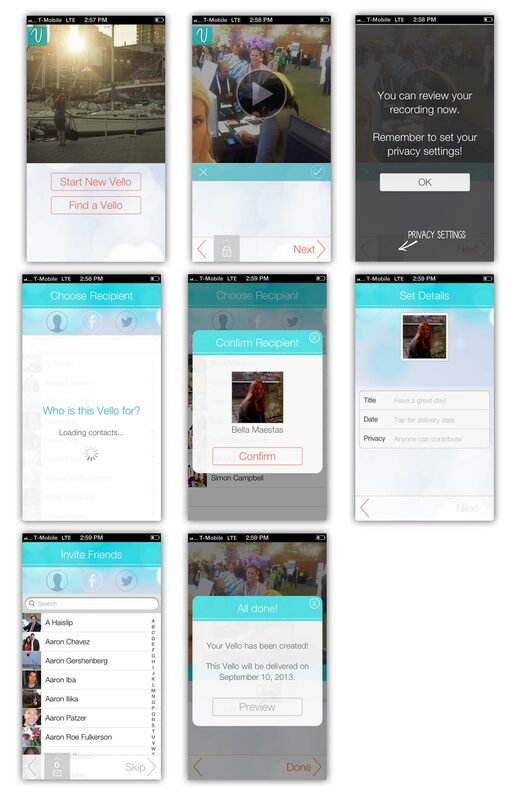 Vello should be live in the iTunes app store in the coming days.